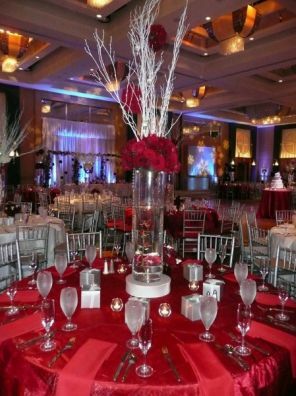 If you are convinced that red is the color that characterizes you and that is why you have decided to incorporate as a VIP guest at your wedding, here are some of the finest floral arrangements and centerpieces with elements of this color, sure to see them you will be convinced that your choice was a good idea. 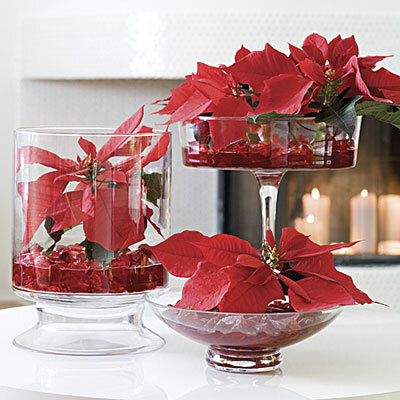 In this first sample has a delicate metal base on which rests a bouquet of red flowers, this arrangement complement a series of candles and crystals suspended between the foot of the bracket and the base of the flowers. Simple and delicate, a bouquet of red roses in square glass vase. 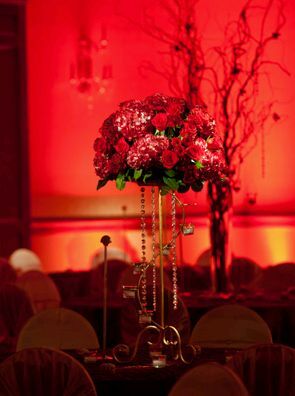 Beautiful arrangements, thanks to the red branches that are embedded in the array itself, attain great height and presence. 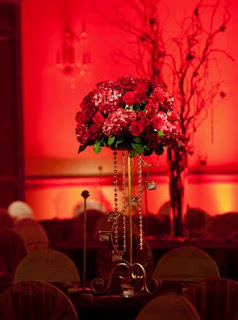 For those who love pearls, this is the ideal opportunity to combine with a romantic and elegant red roses. 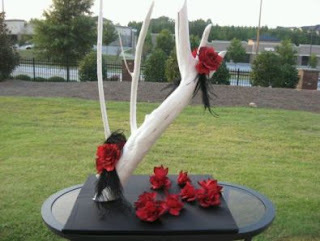 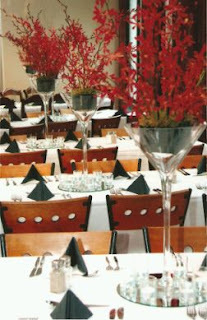 Cute and original floral and centerpiece, is a large canopy with black vases inside and red flowers that spring from them. 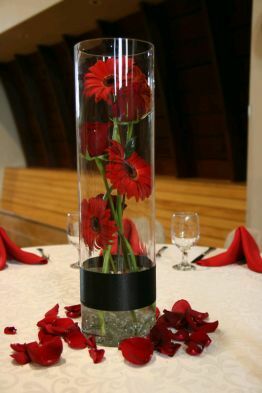 Another example of subtlety, the combination of these red flowers, glass vase, glass base and the black stripe, resulting in a stunning centerpiece. And if subtlety is nothing better than this sample, crystal glasses, petals and red flowers. 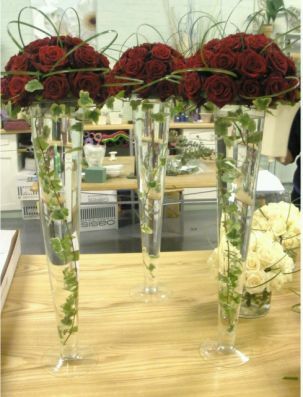 Simple, elegant and unique, it is a slender trunk painted white on which are placed some sort of red roses with green asparagus you will make the contrast. 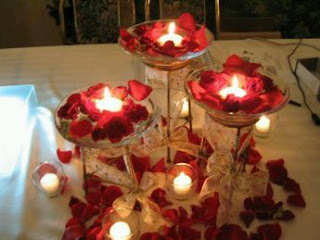 Another example of how well you combine glass vessels, the red rose petals and candles. 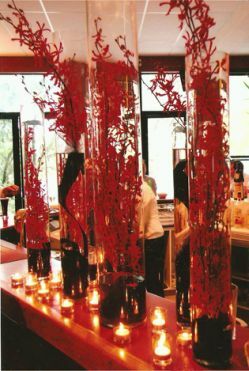 Beautiful, elegant and sophisticated, because for a floral arrangement, does not take much, in this picture you can see this, just a container within which to place long branches with red flowers, the base and black stripe of the vases, is responsible for giving a touch of good taste. 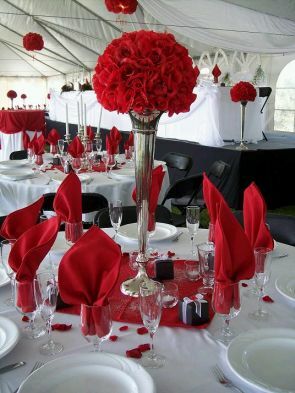 Classic yet beautiful, these centerpieces are not lost, just simply a good container or vase and a bouquet of red roses on top. A variation of the above, except that it has clear vases with branches and leaves submerged in them. 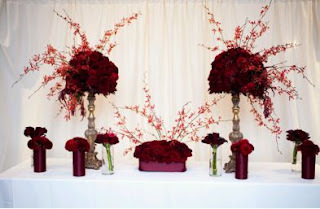 Always looks good combination of flowers, in this case red, branches and Crystals, the other big advantage of this arrangement is that achieved great heights. 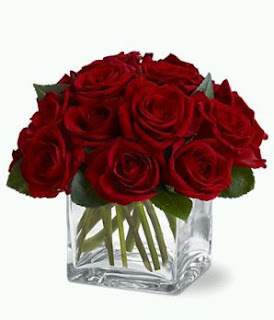 I hope these models will have been pleased.